Offering you a complete choice of products which include saline stand. We are reckoned as major entity actively engaged in developing high-quality Saline Stand. Our strong domain expertise enables us to develop a wide range of saline stands which includes powder coated body and stainless steel body with the option of wheelbase and powder coated base. 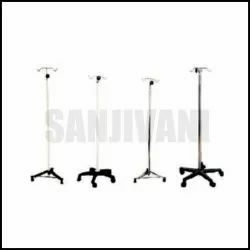 Used to hang the saline solutions the offered stands are extremely compact and can be ordered from us at a leading price.